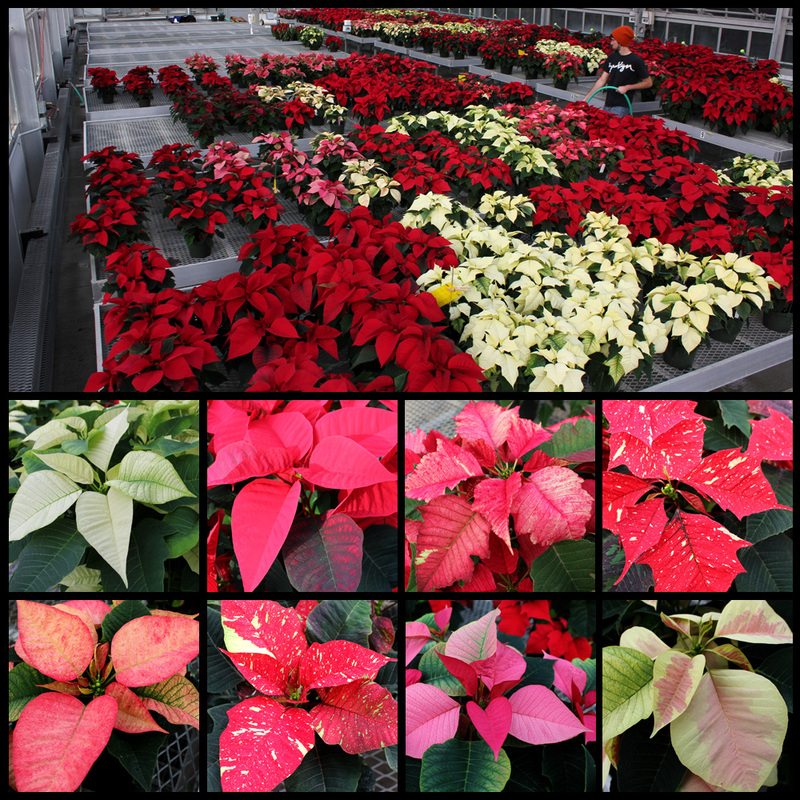 Hortus Forum, Cornell’s student horticulture club, will be holding its annual poinsettia sale on December 3 and 7 from 8 a.m. until 4 p.m. at the Kenneth Post Labs Greenhouses on Tower Road (near the Vet School, view map). Deliveries can be arranged for larger orders on a case-by-case basis for a flat-rate charge of $15. 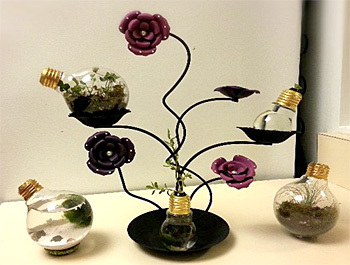 If you’d like to catch a glimpse of students’ final projects in Marcia Eames-Sheavly’s Art of Horticulture class, you can sneak a peak online. You can also see previous class’s work (as well as other class projects and videos) by visiting the Art of Horticulture’s gallery page. Justine Vanden Heuvel (right), viticulturist in the Department of Horticulture, was promoted to the rank of Associate Professor effective November 1, 2012. Vanden Heuvel’s research focuses on the environmental and economic sustainability of wine grape production systems in cool climates. “My goal is to invigorate the rapidly expanding Northeastern grape and wine industry,” she says. In collaborations with food scientists, Vanden Heuvel has studied the effects of viticultural practices and site characteristics on wine flavors and aromas of Vitis vinifera and hybrid cultivars. She has developed practical methods for growers to measure and manage grapevine canopies to optimize winegrape production and improve wine quality. 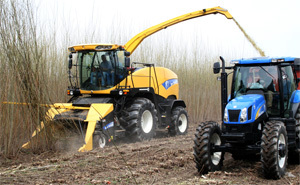 Vanden Heuvel has worked with economists to study the impacts of vineyard management practices on the costs of production and consumers’ willingness-to-pay for the resulting wines. “Our recommendations growing from this research help growers make money – not just great wine,” she says. She has also undertaken a series of studies on how vineyard floor management and other practices can help reduce disease and fungicide use and the movement of nutrients and pesticides from vineyard soils. To put her findings into practice, Vanden Heuvel works with Extension educators in the major winegrape producing regions of Northeast to help growers improve their profits and reduce their environmental impacts. Vanden Heuvel is also extremely active in teaching as the instructor for Viticulture and Vineyard Management (HORT/VIEN 3440), and co-instructor for Grapes to Wines (HORT/FDSC/VIEN 2204). She also co-teaches Sustainable and Organic Grape Growing and Winemaking (HORT/VIEN 3120). Students in that class planted and manage a block of about 500 grapevines at Cornell Orchards – a little more than half an acre – that is now certified organic by the Northeast Organic Farming Association of New York Certified Organic, LLC. “To our knowledge, we are the only university in the country with a student-run organic vineyard or a course devoted entirely to organic viticulture,” she says. Vanden Heuvel teaches students how to assess cluster light environment in grapevine canopies, a key practice for optimizing winegrape production and improve wine quality. Decoded genome paves way for better watermelons [Cornell Chronicle 11/27/2012] – Researchers in the United States, China and Europe discovered that a large portion of disease resistance genes were lost in the domestication of watermelon. “Watermelons are an important cash crop and among the top five most consumed fresh fruits; however, cultivated watermelons have a very narrow genetic base, which presents a major bottleneck to its breeding,” said Zhangjun Fei, a scientist at the Boyce Thompson Institute for Plant Research (BTI) on Cornell’s campus and one of the project leaders. Study: Vegetables can make you look like a hero, and a better cook [Cornell Chronicle 11/28/2012] – “Simply put, vegetables make people feel more positive about the main course and the cook who prepared it,” said Brian Wansink, the John S. Dyson Professor of Marketing at Cornell’s Dyson School of Applied Economics and Management and lead author of the study. Organic farming takes root in Yates County [MPMnow.com 11/26/2012] – “Yates County is a leader in organic farming because we are a leader in farming. Our soils, lakes and positive political climate for agriculture help the county,” says Judson Reid, a vegetable specialist at the Yates County Cornell Cooperative Extension. If you missed Monday’s seminar presentations on Innovations in Education featuring Marcia Eames-Sheavly, Travis Park, and Steve Reiners, it’s available online. Pecha Kucha is a presentation format where speakers use 20 slides for 20 seconds each, automatically advanced. This keeps the presentations concise and lively. Following their 6:40 min talks there is a Q and A panel with the three speakers. 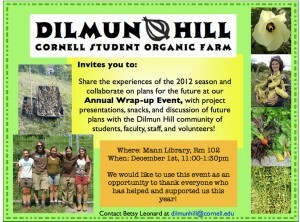 Dilmun Hill, Cornell’s student organic farm, invites you to share the experiences of the 2012 season and collaborate on plans for the future at our Annual Wrap-Up. 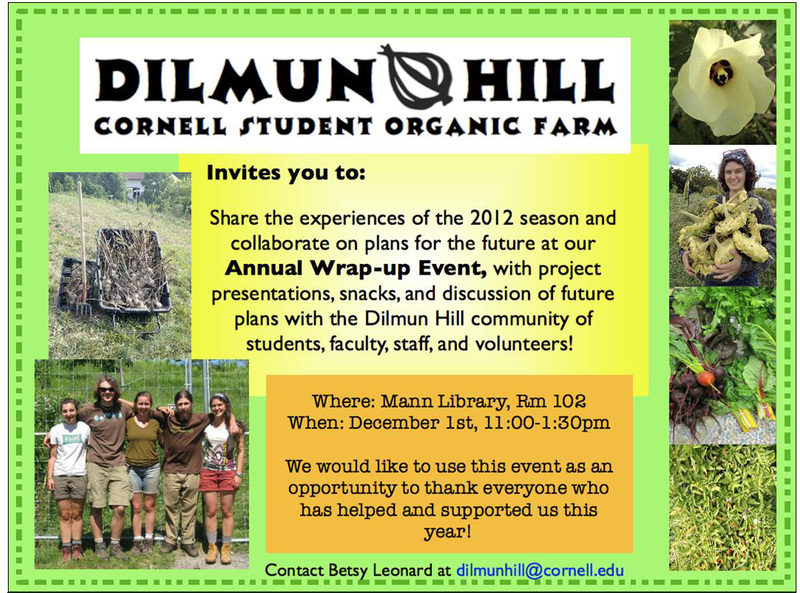 The event will feature project presentations, snacks, and discussion of future plans with the Dilmun Hill community of students, faculty, staff and volunteers. December 1, 11 a.m. to 1:30 p.m.
We would like to use this event as an opportunity to thank everyone who has helped and supported us the year! Jordan Hall, 630 W. North St.
Also, the annual Meeting of the NEERA1005 Sustainable Wood Energy Multistate Research, Extension, and Education Project will be held on Wednesday, Dec. 19, 2012, 8:00 a.m. – 11:30 a.m. Featuring reports by Northeast project participants. The New York State Turfgrass Association (NYSTA) awarded its Citation of Merit to Marty Petrovic (right), professor and turfgrass scientist in the Department of Horticulture, at its Turf and Grounds Exposition November 13-15. The award recognizes Petrovic’s dedication to turfgrass research and education, involvement and support of turf and landscape industry activities, and admiration and respect by peers and colleagues. Petrovic came to Cornell in 1979, where he has developed a research and Extension program centered on the soil and environmental issues facing turfgrass managers in New York and around the world. He has written more than 50 peer-reviewed publications focusing on the fate and transport of nitrogen, phosphorus and pesticides in turfgrass ecosystems, use and environmental impact of organic fertilizers, impact of landscape types on watershed hydrology and surface water quality, turfgrass water use, and soil test calibration. He has also been a principal or co-principal investigator on more than 50 grants. Petrovic’s work was previously recognized with an Environmental Quality Award in 2005 by the U.S. Environmental Protection Agency Region II, the EPA’s highest civilian honor. Petrovic has taught undergraduate turfgrass courses, and served as the major advisor for 17 graduate students and a minor committee member for five others. He helped found the Cornell Turfgrass Management Short Course for turfgrass managers, and written more than 120 technical and popular articles to help them adopt best management practices. If you missed Jason Londo’s seminar Monday, Variation in winter survival mechanisms of wild and cultivated grapevine, it’s now available online.